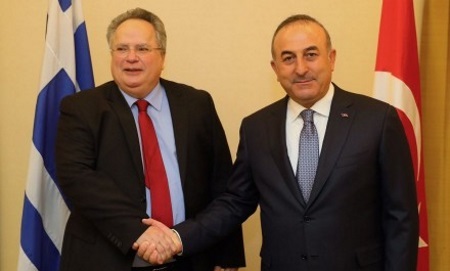 Turkish and Greek Cypriot Leaders will meet again today in Geneva, ahead of the first international Cyprus conference. The meeting of President Mustafa Akıncı and the Greek Cypriot leader Nikos Anastasiades will be held at 11.00 and hosted by the UN Geneva Office. The leaders will hold a brainstorming meeting regarding areas of the negotiations such as Property, Administration and Power Sharing and Security and Guarantees. The Leaders have been negotiating intensively on the island since the Mont Pèlerin talks collapsed. They will negotiate for three days in Geneva, and if the desired outcome is reached, they will start an international conference with the three guarantors of Cyprus. The Leaders will begin their negotiations today and will meet between 09:00 and 13:00 local time (TRNC time: 11:00-15:00) every morning over the next 3 days. The Leaders will hold their second meeting at 17:30-20:00 (TRNC time: 19:30-22:00). Negotiation teams will also meet at 15.00 – 17.00 (TRNC time: 17:00-19:00). UN Secretary General Antonio Guterres will also participate in the conference, as well as the Turkish Cypriots and Greek Cypriots, and the guarantors Turkey, Greece and the UK….. Speaking in a press conference at Ercan Airport ahead of his departure to the Cyprus negotiations in Geneva, President Mustafa Akıncı stated that the political equality of the Turkish Cypriot people should be embodied in the negotiations in Geneva. Akıncı stated that “if the way to a solution does not become apparent in Geneva then the TRNC can continue as a democratic, free and secular state.” However, the President emphasised that their priority is to establish a federal structure on the island. Akıncı also underlined that the negotiating team does not have a policy either to become a part of South Cyprus or to become a province of Turkey. President Akıncı pointed out the importance of the organization of such a conference, the first of its kind for many years. He stated that the Turkish Cypriot side would go to Geneva in a responsible manner, with political will and determination to obtain a successful result. When asked if the Greek Cypriot side have the same attitude, Akıncı called on the guarantor countries, the EU and the international community to help in this regard. In the lead up to the Cyprus Reunification talks in Geneva, Turkish Foreign Minister Mevlüt Çavuşoğlu said that Turkey has always been a step ahead regarding a settlement in Cyprus. “I hope the Greek Cypriot side and Greece will be on the same page with us and we will get a conclusive Cyprus conference on 12 January. This is the last set of negotiations and the last window of opportunity. Hopefully we can get results out of this conference,” said Çavuşoğlu at a press conference following a meeting with his Greek counterpart Nikos Kocias in New York over the weekend. Responding to criticisms regarding the presence of Turkish troops in Cyprus, Çavuşoğlu said that no one should feel threatened by the presence of Turkish troops on the island, unless others have any hostile intentions regarding their future. President Mustafa Akıncı and the Greek Cypriot Leader Nikos Anastasiades are starting off another phase of negotiations in Geneva today, which is scheduled to continue until 12 January. It is expected to be followed by a five-party Cyprus conference with the participation of the Turkish President as well as the Greek and British Prime Ministers. Secretary-General Antonio Guterres believes there is “a historic opportunity” for a breakthrough in upcoming negotiations that would reunite the island of Cyprus after more than four decades, the United Nations said on Friday. The new UN chief will be opening and chairing a conference on 12 January with the Greek and Turkish Cypriot leaders and Cyprus’ three guarantors — Britain, Greece and Turkey — that will be seeking agreement on post-settlement security arrangements, UN spokesman Stephane Dujarric said. Guterres met on Thursday with Turkey’s Foreign Minister Mevlut Çavuşoğlu and late Friday afternoon with Greek Foreign Minister Nikos Kotzias. The secretary-general “appealed to all parties to use this opportunity to find a creative and mutually acceptable solution that addresses the concerns of both communities,” Dujarric said. This entry was posted in News and tagged 5-party Conference Geneva, Antonio Guterres, Cyprus negotiations, Mevlüt Çavuşoğlu, Mustafa Akıncı, Nikos Anastasiades, Nikos Kocias, North Cyprus, TRNC. Bookmark the permalink.